The 1841 Census was the first to list every inhabitant individually. It was taken on the night of 6 June. Fewer details were recorded than in the later censuses: no place of birth, marital status or relationship to head of household. Ages of adults were rounded down to the nearest 0 or 5, e.g. if you were 29 your age was recorded as 25 (although some exact ages are recorded). The enumerator was supposed to mark the start of each new household with a double line, but this was not always done consistently or clearly. Winslow was divided into 3 districts or rounds. The enumerator for District 1 started at Mobbs Farm (Redfield) and continued down the east side of the High Street, north side of Sheep Street, and Shipton north and east of the turnpike. District 2 began at Tuckey Farm, followed the west side of Granborough Road and north side of Horn Street, included the houses around the church, went round the Market Square and up the west side of the High Street. District 3 began with The Walk, then the east side of Granborough Road, south side of Horn Street, Bell Alley, south side of Sheep Street, and Shipton south and west of the turnpike. The Workhouse was enumerated separately. 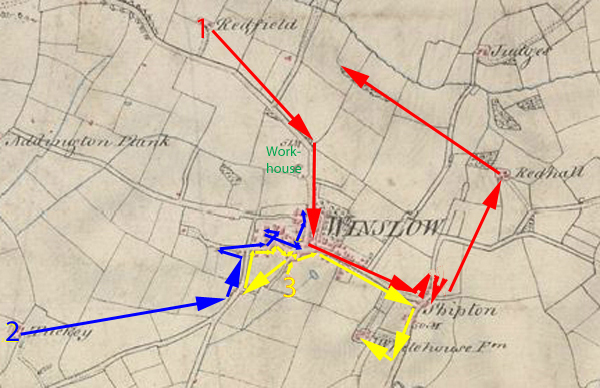 The map is an 1813 Ordnance Survey drawing held by the British Library, used under Open Government Licence v.1.0. Follow the links below to go to the census return for that district. Each page has more detailed maps which you can click on, and you can also click on some of the addresses and people's names for more information. If you want to find whether a particular person is listed in the census, please use the Names index and look for 1841 aganst their name. In transcribing, we have kept the original spelling of names (which is sometimes very unorthodox, especially for enumerator 2) but standardised and given in full the occupations. All names of adults are included in the Names index under standardised spellings. The enumerators seem to have used rather different methods: no.3 regularly recorded women as lacemakers but no.2 did not.